It is mandatory for a laparoscopic surgeon to follow the basic principles of entry and exit to ensure a safe outcome during any procedure; any shortcuts have a strong potential to convert a relatively straightforward procedure into a formidable venture. Most of the organs of the genitourinary system lie within the retroperitoneum or in the extraperitoneal space. The retroperitoneum can be entered either directly or transperitoneally. The choice of the appropriate approach depends on the operation to be performed, the patient’s body habitus, and the skills of the surgeon. 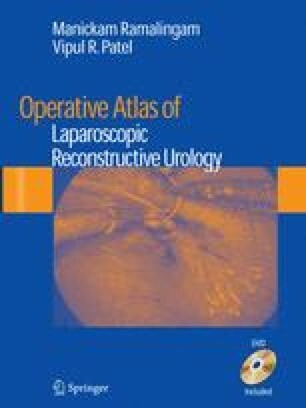 Most urologic laparoscopic procedures can be safely accomplished via a transperitoneal approach. The transperitoneal approach has the advantage of familiar anatomy with ample landmarks to orient a laparoscopist; however, it does expose the abdominal viscera to a potential risk of injury and adhesion formation.